This is the super ideal chair ever! But it's actually much more than just a comfy chair. 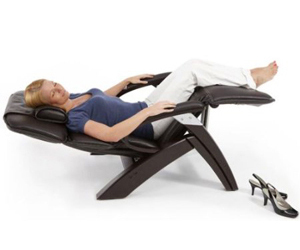 The Inner Balance Zero Gravity Chair goes to a zero gravity position, offers the perfect shape for your entire body to completely relax, and then it spoils you with a multi-point Vibration Massage while you’re blissfully resting on its Generous Faux Leather Vinyl Cushions. Heaven!